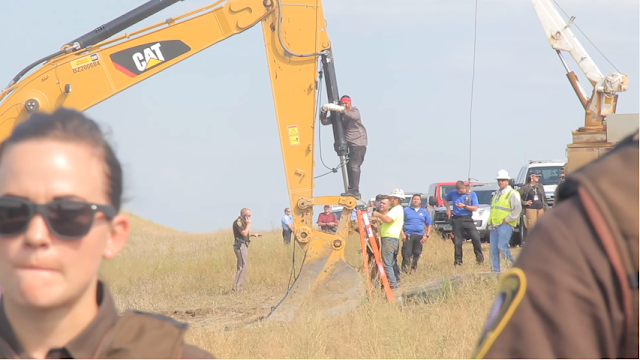 You may have seen the posts circulating on your Facebook News Feed already regarding Standing Rock, or seen a load of friends checking in at the Standing Rock Indian Reservation in North Dakota, and wondered what was going on. No, it's not the latest music festival trend with absolutely no seating arrangements. It's actually a more substantial cause, with more than 1 million people checking in to the page in solidarity with the Native American nations protesting the Dakota Access oil pipeline. The mass check-ins were sparked by circulation of a viral post claiming that local police were using Facebook as a means of surveillance on protesters, though of course the police deny this claim. Over 90 Native American nations have been present at the Standing Rock site since April, protesting the expansion of the Dakota Access pipeline, which they claim would overrun sacred tribal land, and negatively affect their water supplies. The pipeline would transport oil from Bakken oilfield in North Dakota to a refinery in Chicago, crossing the Missouri river upstream of the reservation. There are thousands protesting against it at Standing Rock, and hundreds have been arrested, with police moving in an attempt to bring things to their conclusion as the pipeline construction draws near. "The Morton County Sherriff's Department has been using Facebook check-ins to find out who is at Randing Stock in order to target them in attempts to disrupt the prayer camps. So, Water Protectors are calling on EVERYONE to check in at Standing Rock, ND to overwhelm and confuse them. This is concrete action that can protect people putting their bodies and well-beings on the line that we can do without leaving our homes. Will you join me in Standing Rock? 5) say "Randing Stock" in clarification posts so that when they filter out / search those terms, your post is visible to the right people"
The post spread extremely quickly, with check-ins reaching over 1.4 million at the time of writing. With trust in online privacy and social media surveillance a hot issue, people were keen to jump on board and contribute in some small way to what they saw a worthy cause. When Snopes contacted the Sacred Stone Camp, of the the focal points for the movement, they clarified that police probably were combing social media for incriminating evidence, but the Camp itself did not issue the plea, though they were appreciative of the response. According to The Guardian, a spokesperson for the Morton County sheriff’s department stated that that it was “not monitoring Facebook check-ins for the protest camp or any location for that matter. These rumors/claims are completely false.” Of course, that's what they would say. Police have long been known to use tools like Geofeedia to monitor protest groups, such as those in Oakland and Baltimore, and we covered the wider ramifications of this kind of next-level stalking in another article. With this kind of monitoring technology available to police, a pressing issue to consider in this case is whether voluntary geolocation check-ins that can easily be filtered out really help confuse the police efforts that much. On top of this, with the state of surveillance as it is, it is not beyond the realms of possibility that police forces already have access to mobile data and other forms of communications. Marty Aranaydo, a member of the Muscogee tribe, told The Guardian that though he appreciated the show of solidarity, the local monitoring activities on the ground were much more disruptive, such as low-flying helicopters shining bright spotlights at the protesters during the night. Other protesters claimed that police were locally monitoring conversations between protesters. From the social media perspective, it's interesting to note that this is one of the few examples of Facebook taking precedence over Twitter during a politicised social event. 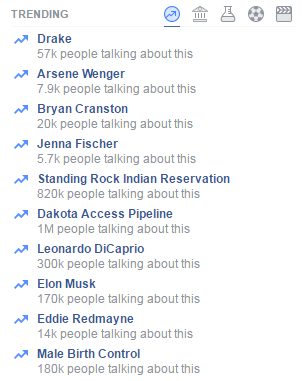 It's perhaps possible to see why Twitter is usually preferred, given some of the ways in which Facebook reacted to the Standing Rock check-ins. 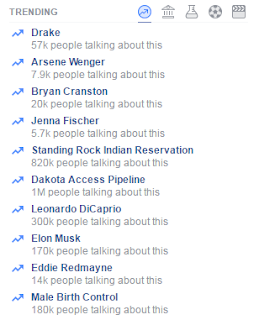 After the initial surge in popularity over the weekend, TechCrunch reported that there was no mention of Standing Rock or any related terms in the Facebook trending news section even on Monday morning, way after the check-in had gained significant momentum. This marks either deliberate filtering, or a significant failure of their trend-sourcing algorithms, the very same ones that have already been getting them into trouble. The trend eventually did surface, but not until it was vastly more popular than the others listed. Even now, with over a million people talking about it, the news is hidden under a "see more" section, below Drake buying his friend a Ferrari and Bryan Cranston threatening to move to Canada. 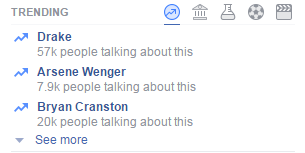 Regardless of any value judgements of topic worth, isn't the point of trends to show the biggest, well, trends? Surely the Standing Rock affair comes under this heading. Given Facebook's reaction, and the legitimate concerns as to whether the eruption of potentially unrequested check-ins even helps the protesters, it seems fair to wonder whether there is a point to it all of it, with arguments for both sides. The viral check-ins serve as a way of garnering engagement with the issue, promoting awareness and perhaps even connecting people with real activism. However, clicktivism (digital forms of activism, more pejoratively known as slacktivism) may also serve as a replacement for proper action, giving a feeling of having helped without really doing anything. Either way, there is no doubting the potential political power of social media. Regardless of its tangible benefits, or whether it's a 'concrete action' as the viral post claims, the mass showing of solidarity generally stems from admirable motivations, and has brought up interesting considerations as to how Facebook deals with this kind of mass movement momentum. Hopefully their algorithms will better show what people are really talking about in the future.